"He was one of those people that truly sought this job," Weymouth Police Chief Richard Grimes said of Officer Michael Chesna. 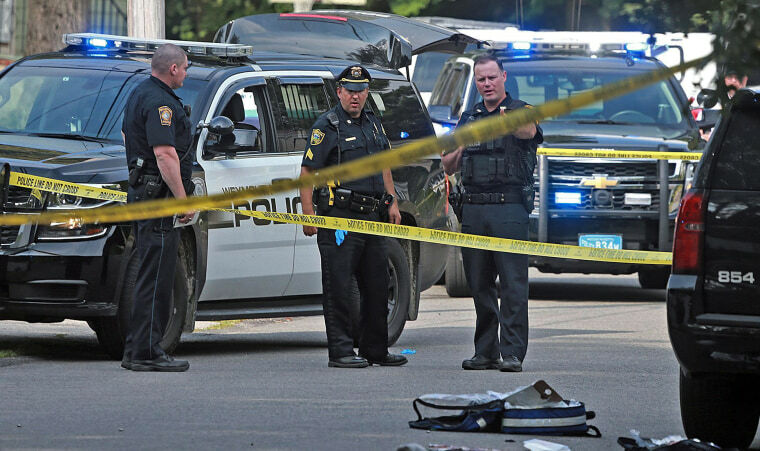 A Massachusetts police officer killed over the weekend was shot 10 times with his own gun by a man who’d stolen it after he struck the officer with a rock, court documents filed Monday allege. Authorities have charged Emanuel Lopes, 20, with first-degree murder in the killings of Weymouth Police Officer Michael Chesna, 42, and a bystander, Vera Adams, 77. Weymouth Police Chief Richard Grimes told reporters that Monday would have marked Chesna’s sixth year with the department. "He was one of those people that truly sought this job," Grimes told reporters Sunday. "He was fortunate enough to get it and very much appreciated it." A criminal complaint filed in Quincy District Court on Monday alleges that the incident began with Lopes driving erratically down Main Street in Weymouth, 16 miles south of Boston, on Sunday morning. After striking an SUV, Lopes allegedly ditched his BMW sedan and ran toward a nearby neighborhood. Chesna, who’d been dispatched to the scene, then saw Lopes hurling a rock through the window of a house, the documents allege. A neighbor told police that after Chesna got out of his car, Lopes struck him in the head with a rock, causing the officer to drop his gun, according to the court documents. Lopes "picked up the firearm, stood over Off. Chesna, and fired approximately 5 rounds in the area of Off. Chesna’s head and approximately 5 rounds in the area of Off. Chesna’s torso and legs," according to the documents. Chesna was pronounced dead at a hospital. As other officers pursued Lopes, the documents allege, he entered the backyard of a nearby home and fired three rounds, striking Adams in the chest and killing her. Adams, who neighbors recalled as a kind widow who’d retired from an insurance job, was in her sunroom at the time, NBC Boston reported. Lopes was shot in the leg by responding officers and taken into custody with an empty gun still in his hand, the documents allege. He’d fired 15 or 16 rounds. Speaking to NBC Boston, Lopes’ mother said her son struggled with mental health issues. She’d obtained a restraining order against him and recently sought help for him in the nearby city of Quincy, the station reported. The mother, who was not identified and declined to appear on camera, said Lopes refused to take medication. "I am heartbroken and I am extremely sorry," she told the station in a phone interview. Chesna, an Army combat veteran who was married with two young children, served in Iraq and Afghanistan, Gov. Charlie Baker said. Grimes added that Chesna joined the military "to help open the doors for him to get on this job." During a vigil at Weymouth High School Monday night, Chesna's mother thanked the community for its support, The Associated Press reported. "Michael would be so proud," she said. "I have never been prouder to be from Weymouth." Grimes, who also spoke during the vigil, weighed in on the ongoing debate over use of force by police officers, according to the AP. "Hesitation gets officers hurt," he said. "The courts, the politicians and everyone in this country should put themselves in that split-second decision, and you tell me, 'is a rock a rock?' I stand here today and tell you it's not.'" Lopes was expected to be arraigned on Tuesday, possibly from his hospital bed, The Associated Press reported.